Not so long ago, Facebook suddenly ended the “free love era”. They drastically scaled back the organic reach of brands. Big brands saw a reduction in engagement ranging from 30 to 70%, according to a report from Simply Measured. This scaling back is also known as “Facebook Zero”. More recently they implemented additional measures to reduce “click-bait headlines” and banned “like-gating”. Not only Facebook is taking this type of measures. Google is using new and advanced search algorithms to filter for quality and relevant content only, and Twitter also announced to start filtering on relevance. What this comes down to is that we seem to be forced to go increase our paid advertising. The only problem with that is that paid advertising is increasingly become a less effective marketing tactic. The current content explosion, the number of communication channels, and the number of devices that buyers are using today is further challenging you as a marketer. All the messages you send, no-matter which channel you use, are less and less likely to reach your buyers. Something special happened in the course of 2012: trust of buyers in brands suddenly reduced. It wasn’t the economic recession what caused this. Suddenly buyers started trusting “a person like yourself” and “regular employees” much more than they did before. This change is not unusual. People always have relied on other people to help them make purchase decisions. 84% of all people worldwide say friends and family are most influential to their behavior, says a study from Nielsen. When it comes to buying products, today, more and more of the decision making is done online. And social media now serves as a surrogate mouth-to-mouth. The Edelman Trust barometer changed suddenly between 2009 and 2014. Buyers go out on these networks and consume content, participate to discussions with friends and professionals. They connect with people that are like them. They connect with their peers and their family. A friend trusts a friend. An expert trusts his fellow expert. People with similar interest gather in specific Facebook groups, LinkedIn groups, Twitter chats or Google Hangouts. Some of these groups are closed groups, meaning that you can only get access when your are considered a peer by the group members. When Facebook and other social networks are making it more difficult for us to reach our buyers, luckily there’s one thing social networks cannot stop us from doing: they cannot stop employees from having social updates and social conversations. It’s the very lifeblood of their existence. As they say in French, it is their “raison d’être”. And that’s what social business is about. Employees connect with buyers, influencers and peer experts. These employees are trusted by their peers. When these employees consistently provide meaningful value to their peers, eventually their peers will contact your employees in the case of a question or a commercial opportunity. When you create content, your content is usually published on your website, and on social media. But the social power of employees is often underestimated. British anthropologist Robin Dunbar suggested that 150 is the limit to the number of people with who you can have a stable social relationship. Using this average number, a simple exercise learns us that a company of 300 employees can amplify a single piece of content to 45.000 people. That’s the power of a social organization. New tools like Addvocate, SocialSeeder, GaggleAMP and others can help your employees to create, curate, and share content for your company. Expanding this amplification power to your partners and brand advocates can further help you spread your message. 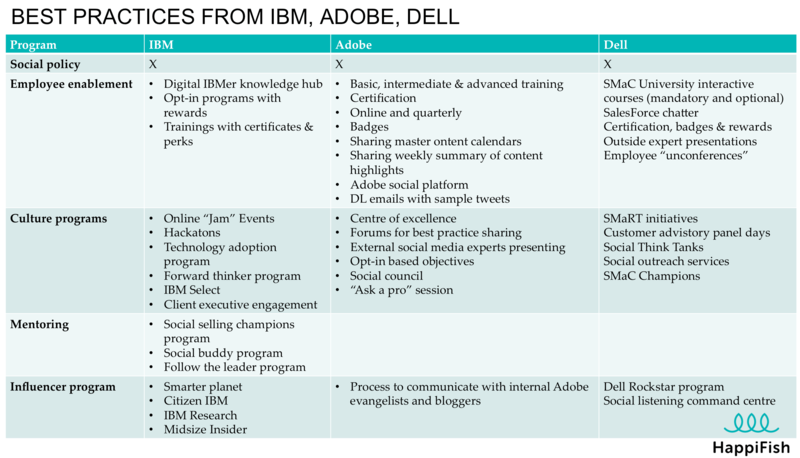 How have IBM, Adobe, and Dell become a Social Business? Big companies like IBM, Adobe and Dell have been working for years to motivate employees to connect with likeminded people. They have introduced platforms for monitoring, collaboration and sharing. And they have created programs to stimulate employees to create content, share content and to collaborate across departments. Employee enablement: they all had programs in place to remove barriers which employees see. These programs ranged from training certificates and perks at IBM, sharing master content calendars with employees at Adobe, to outside expert presentations at Dell. Culture programs: once employees have everything they need, from tools to skills, cultural programs drive the behavior to create, share and collaborate internally and externally. At IBM you have “Jam” events, the Forward Thinker Program and IBM select, just to name a few. And at Adobe they use a centre of excellence, forums, opt-in based objectives etc. Similar programs exist at Dell. Mentoring: in the case of IBM, they had program in place to get leadership actively involved. I didn’t really find this at Adobe or Dell, but it might exist at these companies. Influencer programs: all 3 companies had program in place for influencer marketing. IBM organizes them towards specific personas like mid-size company managers, researchers, etc. Adobe had a specific program to communicate with Adobe evangelists and bloggers, while Dell has similar programs. The budgets, time and resources these companies spend to do all of this is massive. Obviously this is impossible for smaller companies. What can smaller companies learn from these large companies? Content amplification, and social conversations are important to any company, independent of the size of your company. The big question obviously is : How? Employees won’t publish your content on their Facebook, not even if you ask them nicely. Oh, yes, the’ll do it once, or twice. But then life takes over again, and they need to focus on the core tasks of their job, this is one of the first things that the’ll drop. Very often companies understand the need for a social policy and related training programs. Make sure in your on-boarding program for new employees that you select employees based on their social savvyness, and make sure they get all the trainings they need. Next to that, provide certificates and perks. Often employees are best motivated through social recognition, more than receiving money. Badges, certificates and public and visible perks will motivate other employees to achieve the same status level. Incentivisation through course credit, recognition in public and team meetings, and other rewards are a good addition to motivate the right behavior. When you train employees on social media, social selling, tools etc, some of them will be very enthusiastic to start applying what they’ve learned. But they back-out at the last minute because they are afraid of doing something wrong. Alternatively, they might give it a shot for a couple of weeks, and then stop because it’s hard, takes time, and the return isn’t immediately visible. The best practices in this case is to provide everyone with clear objectives. Explain the task they need to perform within a given timeframe. Depending on the skill level you might define levels that people need to reach before moving on to more complex tasks. Once a particular objective has been reached, the employee moves to a new task. It is important is to make sure you have visibility on the progress of everyone. That’s why it is a good idea to include this in face-to-face meetings that employees have with their boss. Internal tools for collaboration, social sharing and content publication are important. What you see often is that early adopters and internal social ambassadors within the organization organically “find” each-other. The’ll then select their own small tools like Wiki’s, social listening tools like Hootsuite and distribution tools like Buffer. The problems begin when you have multiple of these groups starting to set-up initiatives. You’ll sit on multiple platforms, and when you try to get some alignment across these groups, choices will need to be made. In that case, let the groups decide on what platforms they want. Don’t enforce platforms because IT feels they are better. A question that I often get when it comes to social business is: who should be leading? is this something that must come from leadership, or is that a “bottom’s up” approach, meaning that it is developed and directed by regular employees ? My answer is : both! Employees drive the change, and decide on what needs to happen. Executive leadership validates the change by providing greater resources and greater rewards. Whenever you are changing towards social business, do not start with building big programs. You’ll fail. This type of change requires time. By going through the transition, you’ll only learn by doing. Building roadmaps in advance can be done on a very high level, but don’t map it out in detail. Focus on small, reachable goals, re-evaluate constantly, and work toward larger goals. That’s it ! Adobe, Dell and IBM have made big advancements in becoming a social business. I hope this little exercise will help you in setting your first steps towards becoming a social business.